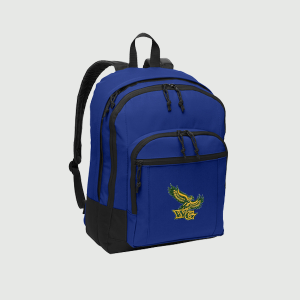 Custom embroidered backpacks are favorite customer gifts, employee gifts, and student gifts. Customize any of the featured backpacks below with individual names and/or your logo or custom design. Backpacks have come a long way from their humble beginnings as the simple leather book straps of the 1900s and the plain canvas satchels of the 1930s. Fast-forward to 2017 and modern backpacks are sleek and attractive and made in a range of sturdy, lightweight materials. They are meticulously compartmentalized to hold everything from computers, tablets, and phones to pens, pencils, papers, overnight travel necessities, camping gear and more. Walk down any busy street and you’ll likely see backpacks used by working professionals, tourists, walkers, hikers and students of all ages. Here are a few of our favorites backpacks, all available from Broken Arrow T-shirt Printing and Embroidery. 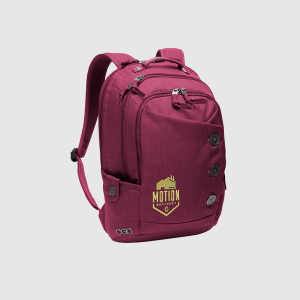 Each backpack can be adorned with either custom screen-printed logos or embroidered with individual names and/or numbers. Prices start at under $20 to fit any budget. Port Authority® Basic Backpack; 16.75 inches high by 12.25 inches wide by 4 inches deep. 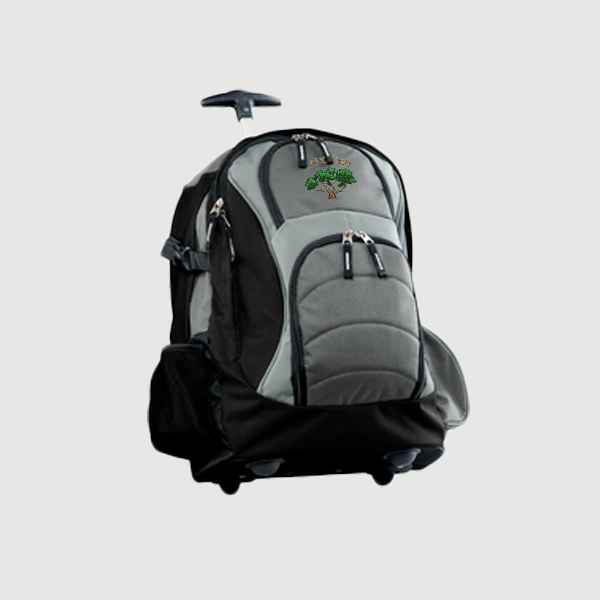 This very affordable polyester canvas backpack features a large main compartment with a laptop sleeve and a zippered front pocket with a mesh organizer. The back and straps are padded for extra comfort. The laptop sleeve fits most 15-inch laptops. This reasonably priced denier polyester backpack is ideal for weekend travel as it can be carried on your back or rolled through an airport terminal or hotel lobby. A clever, one-hand push button handle extends to 18.5 inches. It features two large front pockets, side pockets, a mesh water bottle holder and reinforced bottom. 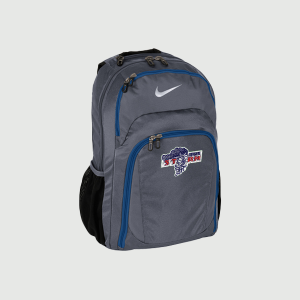 Adorned with Nike’s signature swoosh, this sporty backpack is made from a combination of polyester and nylon and has a laptop sleeve that will fit most 17 inch laptops. It has front zippered pockets with an organization panel and side-mesh pockets. With its distinctive metal buttons and adjustable shoulder straps designed to fit women, the Melrose cotton polyester backpack is not only chic, it protects most 15-inch or smaller laptops while organizing papers and other necessities. The backpack includes a cord storage pocket, a separate file compartment sleeve, two fleece-lined side pockets, and a front slip pocket for quick and easy access.